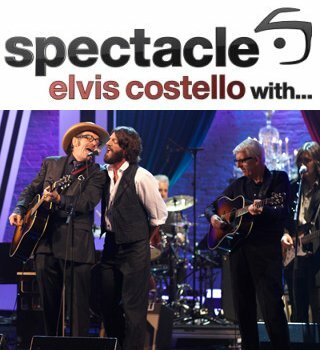 I was fortunate enough to attend the original taping of Wednesday night’s Spectacle: Elvis Costello With”¦ (airing Dec 23 at 10PM on Sundance) and after seeing the entire thing on TV, I think this episode plays better now that it has been whittled down to a television friendly 45 minutes. As for the performances within the show, the full band rendition of “The Weight” (complete with 3 guitarists, 2 drummers, 2 bass players, 1 piano player, 1 keyboard player and Ray LaMontagne) was the highlight of the night for me, followed closely by Richard Thompson‘s “Shoot Out The Lights” and Nick Lowe‘s “The Beast In Me”. While the original taping suffered from too much Elvis and not enough guests, the edited version is actually more watchable because they were able to cut out some of Elvis’ more long-winded questions and focus a little more on the guests answers. Each guest got more or less an anecdote and a song and then they all came together for the big finale with “The Weight”. Levon Helm, who was defying doctor’s orders to be at the show, was the only guest who actually didn’t talk at all because of a severe vocal strain, so he and Elvis did a “Mr. Ed” routine where Helm answered questions via drum rolls (it was corny, but I guess they had to leave it in, otherwise Levon wouldn’t have gotten any “interview” time at all). For those of you who’d actually like to hear the man sing, I’m pretty sure Mr. Helm will be in better voice when he plays his big show at Terminal 5 on January 7, 2010 (Buy Tickets) with Okkervil River. Our friends in the Garden State can catch Levon at Harrah’s in Atlantic City on February 26 and then again at The Wellmont Theatre in Montclair, NJ on February 27. 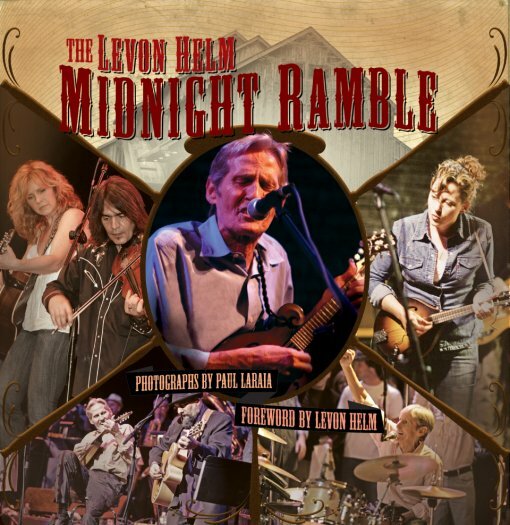 In honor of tonight’s episode of Spectacle and Levon Helm‘s recent Grammy nomination for his album Electric Dirt, I’m giving away a copy of Midnight Ramble, a gorgeous looking coffee table book featuring artist testimonials and some of the best photographs from Levon’s monthly all-star jam session at his home/studio/farm in Woodstock, NY. (US residents only, contest ends on December 31, 2009 at 11:59 PM.) Click here to enter the contest. The official record of the incredible down-home jam sessions held by Levon Helm, the charismatic drummer, singer, and sometimes mandolin player for The Band. Accompanying the spectacular photos are testimonials and remembrances from the notable blues entertainers and musicians who have joined the Ramble. Contest entry form and more Levon Helm tour dates after the jump.